Mark Turner_3, originally uploaded by vladrus. I'm afraid I have some sobering news to share, though, about one of my friends, someone who is an inspiration to countless musicians, a true genius, and a beautiful spirit: Mark Turner. A few minutes ago, I received a text message from Kurt Rosenwinkel informing me that Mark severely cut two of his fingers with a power saw, and is in the hospital awaiting surgery tomorrow morning. They will be trying to reattach nerves, tendons, and arteries. With luck, the surgery will be successful, and he will eventually regain the use of his injured fingers. It'll be no less than 6 months of rehab, though. I asked Kurt whether I should keep it quiet or not, and he told me it would be okay to blog about it and get as much positive energy sent in Mark's direction as possible right now, especially until tomorrow's surgery is finished. So, everyone, please keep him and his family in your thoughts and prayers tonight, and tomorrow morning. My heart is hurting as I imagine the pain that they must be going through right now. There's not much more I can say. I'm having a difficult time imagining what kind of silver lining can be found in a senseless accident of this kind. Let's just hope that everything heals, that his recovery is speedy, and that he'll soon regain full command of his instrument and will be once again creating those moments of transcendent musical beauty, in the way that he always so uniquely does. 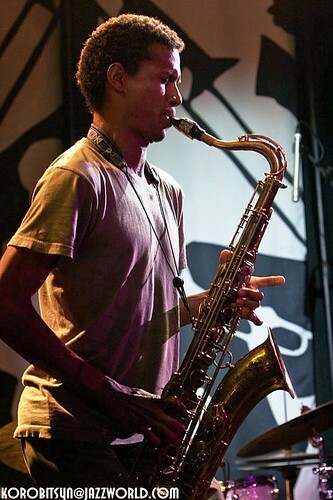 Mark Turner is, of course, one of the greatest saxophonists of his generation. Here's hoping his surgery is a miraculous success. The show of support for Mark over the last few days has been incredible. Please keep the positivity flowing in. A lot of people have been asking for an update, so I wanted to pass along the little bit of information that I know. The surgery was this morning, with one of the best hand surgeons in the country, and it apparently went as well as could be hoped for. It'll take some time to know whether the procedure will ultimately be successful in restoring the full use of his hand, but everyone is hoping for the best. Mark is, of course, inspiringly Zen about the whole thing, already accepting things however they turn out. We'll just have to wait: time will tell, I guess. In the meantime, keep all the support coming. Many people have asked if there's a way they could help financially, since he's basically lost his main source of income for the next 6 months at least. I'll look into it to see if he's receptive to that kind of thing. Will let you know. I heard about this yesterday afternoon. Terrible news. Hopefully his physical therapy will go well. If not, well, I'm sure he'll find some way to play. Django did, right? Give us some knews when it's possible, and how I can help financially. Mark is my cousin and I love him very much. I remember when Mark first started to play the Sax and he was hard to listen to. Now he is a pro and love his music. I will pray every night until I hear he is back. I can't wait to hear you perform live.